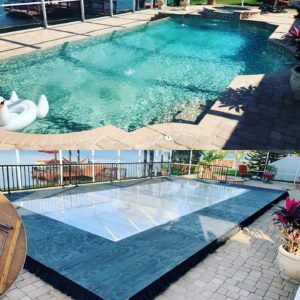 Our dance floor pool covers are extremely popular. Most of the times we try to create a basic rectangular shape, around your pool. 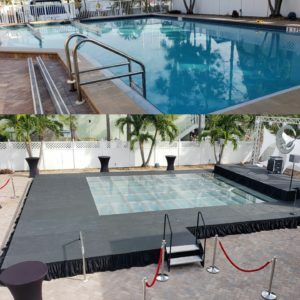 But we can also customize our cover to oval, or kidney shape, Our Commercial Grade Structures has the ability to cover your pool area so you gain the square footage you need for your event. We Provide event pool cover rental in our standard surfaces black plywood. 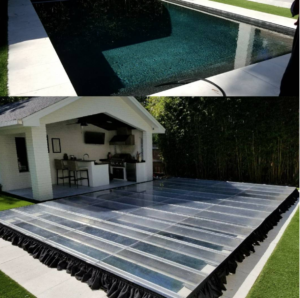 However, if you want that WOW factor for your event, Fiesta Solutions offers a clear plexiglas surface that turns any pool into a elegant setting. Need more style? Add Led lighting or floating candlelights to set the atmosphere.